We are accepting submissions for the Charlene Conrad Liebau Library Prize for Undergraduate Research now until April 18 at 5 p.m. Undergraduate students of all levels and disciplines may apply. We especially welcome submissions from lower division students, whose projects are judged separately from those of the upper division. More details are available on the website. Recent Berkeley graduate Julia Burke begins her essay, “Over Mary’s Dead Body: Frankenstein, Sexism & Socialism,” a historiography and cultural critique of Shelley’s Frankenstein, with the above epigraph from Mary Wollstonecraft, the great political philosopher and Mary Shelley’s mother. 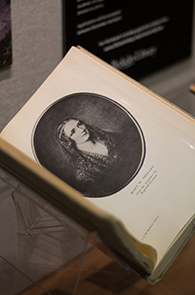 Burke’s research into the reception of Frankenstein and in its possible influence on socialist radicals of the 1840s earned her the prestigious 2018 Charlene Conrad Liebau Library Prize for Undergraduate Research, an annual prize awarded to students who have done exceptional research and made significant use of the Library’s resources. 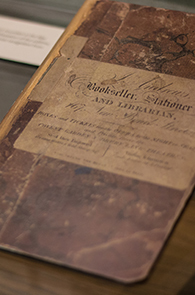 Burke’s paper is the subject of this semester’s rotating Library Prize Exhibit, located on the second floor of Doe between the Heyns Reading Room and Reference Hall. 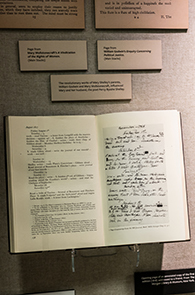 Drawing on the Library and the Bancroft’s broad collections, the exhibit outlines Burke’s arguments in visual form with digitized replicas of the original 1818 edition of Frankenstein, an early copy of The Communist Manifesto, letters, contemporary reviews, and more. The exhibition of Burke’s project coincides with the bicentennial of Frankenstein’s publication. Originally published anonymously, Frankenstein’s true author was greatly contested, as Burke explores. Today it is one of the most important works of the literary canon and the most read novel in undergraduate courses nationwide. 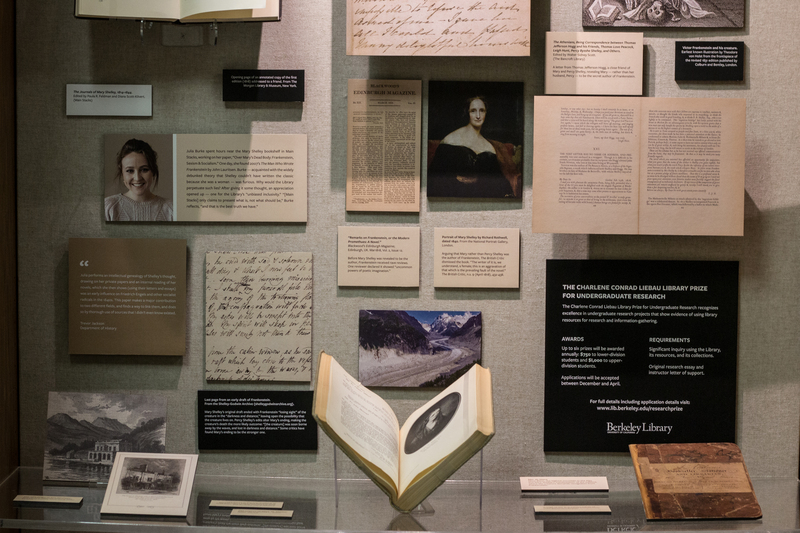 The exhibit was curated by Stacy Reardon, the Literature and Digital Humanities Librarian, and designed by Aisha Hamilton, the Exhibits and Environmental Graphics Coordinator. The exhibit will be up until April 2019. 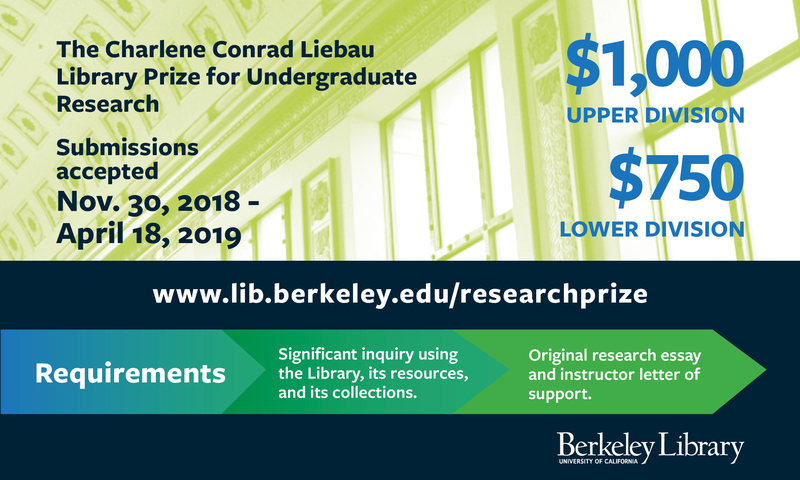 The Charlene Conrad Liebau Library Prize for Undergraduate Research is awarded annually, and submissions are now open to all undergraduates until April 18, 2019. Any project from a credit course at U.C. Berkeley from Spring 2018 to Spring 2019 (lower division) or Summer 2018 to Spring 2019 (upper division) is eligible. The project can be in progress as of the due date of the application. In addition to a monetary award of $750 for lower-division winners and $1000 for upper-division winners, the recipients of the Library Prize publish their work in eScholarship, and two will be featured in an exhibit in the Library. Find out more information here. You can see the rest of this year’s winners and honorable mentions here. Don’t forget to stop by the exhibit to see Burke’s work in person. More books related to Frankenstein in honor of the bicentennial can be found here.